To Cite: Alikhani A, Najafi N, Davoudi A, Tiroum S, Khademloo M R, et al. Microbiological and Minimum Inhibitory Concentration Study of Ventilator-associated Pneumonia Agents in Two University-associated Hospital Intensive Care Units in Mazandaran, Arch Clin Infect Dis. 2012 ; 8(1):8-13. doi: 10.5812/archcid.16034. Background: Ventilator-associated pneumonia (VAP) is a type of nosocomial pneumonia which develops more than 48 hours after endotracheal intubation. Early recognition and treatment of VAP is important, since timely and appropriate management can be lifesaving. Objectives: This study aimed to determine the antimicrobial susceptibility pattern of microorganisms causing VAP in the intensive care units (ICU) of two university associated hospitals in the province of Mazandaran in Iran from 2008 to 2010. Materials and Methods: This study was performed on VAP patients diagnosed with the clinical pulmonary infection score (CPIS) in ICU’s of two university hospitals. For each patient suspected of VAP, quantitative culture of endotracheal aspiration (QEA) was performed and minimum inhibitory concentration (MIC) was determined by a micro dilution test. Data was analyzed by the SPSS 17 software and a P < 0.05 was considered to be statistically significant. Results: In this study, the type and the frequency of the microbial agents causing VAP was as follows: coagulate negative staphylococci (23.3%), Escherichia coli (E. coli) (21.7%), Staphylococcus aureus (S. aureus) (18.3%), Pseudomonas aeruginosa (P. aeroginosa) (18.3%), Enterobacter spp (11.7%). and Klebsiella pneumoniae (K. pneumonia) (6.7%). 35.71% of coagulate negative staphylococci were sensitive to vancomycin. All of the isolated E. coli was resistant to ceftazidime, but 50% sensitive to gentamicin and meropenem. 54.54% of isolated S. aureus were resistant to vancomycin. All of the isolated P. aeroginosa cases were sensitive to imipenem while 50% were resistant to ceftazidime. Conclusions: In patients with VAP, carbapenems had good activity against P. aeroginosa. Increasing resistance of S. aureus to vancomycin requires more attention and further studies. Ventilator-associated pneumonia (VAP) refers to pneumonia that develops at least 48 hours after the initiation of mechanical ventilation (1, 2). It is most likely caused by aerodigestive tract colonization, followed by aspiration of contaminated secretions into the lower airways. Hence, factors that increase the risk of colonization and aspiration increase the risk of VAP, while preventing these events can significantly reduce the risk of its occurrence (3-8). Diagnostic dilemmas intensify in practice settings where lung biopsies are seldom obtained (9-11). Most clinical assessment tools and guidelines have incorporated a mixture of symptoms, signs, radiographic findings, and culture results in their diagnostic approach to VAP. The Clinical Pulmonary Infection Score (CPIS) represents one such approach. A number of studies from the past two decades have identified cumulative incidence rates of 0.5 to 1.0% in U.S. hospitals. Extrapolations of these figures to hospital admission data suggest that 250,000 to 300,000 cases of nosocomial pneumonia occur annually. Hospital-wide surveillance studies have average incidence rates of 0.8 cases per 1000 patient-care days (3, 7). The results of microbiologic studies allow us to reduce the scope of antimicrobial therapy to target only the isolated pathogen(s). In two studies, negative PSB and BAL cultures allowed discontinuation of antimicrobial therapy (12, 13). Antimicrobial resistance has emerged as an important determinant of outcome for patients in the intensive care unit. This is largely due to the administration of inadequate antimicrobial treatment, which is most often related to bacterial antibiotic resistance. Intensive care units are unique because they house seriously ill patients in confined environments where antibiotic use is extremely common. They have been focal points for the emergence and spread of antibiotic-resistant pathogens. Effective strategies for the prevention of antimicrobial resistance in ICU settings have focused on limiting the unnecessary use of antibiotics and increasing compliance with infection control practices. Clinicians caring for critically ill patients should consider antimicrobial resistance as part of their routine treatment plans. Careful and focused attention to this problem at the ICU and using a multidisciplinary approach, will have the greatest likelihood of limiting the development and dissemination of antibiotic-resistant infections (14). This study was designed to determine the antimicrobial susceptibility pattern of microorganisms causing VAP by the minimal inhibitory concentrations minimal inhibitory concentrations (MIC) determination method. This study was performed on patients suspected of VAP in ICUs of two university associated hospitals in the province of Mazandaran in Iran from 2008 to 2010. Cases that had a CPIS score of < 6 were excluded from this study. After calculation of the CPIS score, cases that were suspected of VAP were further investigated. The clinical pulmonary infection score, used in some ICUs, gives points for clinical, radiographic, physiologic, and microbiologic data for a single numerical result. A clinical pulmonary infection score of more than 6 correlates well with the presence of clinical pneumonia (Table 1) (15). a PaO2/FiO2, ratio of arterial oxygen pressure to fraction of inspired oxygen. b Abbreviations: ARDS, adult respiratory distress syndrome; CHF, congestive heart failure. The microorganisms in these cases were isolated and their MIC was determined by the micro dilution test. This was achieved by obtaining the pulmonary secretion of these cases via intubation and endotracheal aspiration. Subsequently, these collected specimens were sent to our clinical microbiology laboratory (from July 2008 to March 2010). Specimens submitted to the laboratory were cultured on Mueller-Hinton Agar, blood agar and Todd-Hewitt broth medium. Quantitative positive culture was > 100000 cfu/mL. 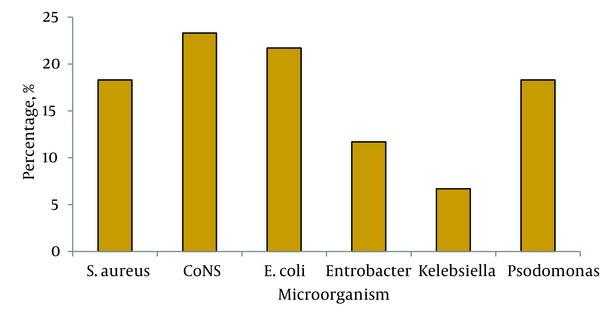 Microorganism isolates were identified by conventional laboratory approaches, including Gram stain and colony morphology. MICs for cloxacillin, vancomycin, ceftriaxone, ceftazidime, amikacin, gentamicin, imipenem and meropenem were determined by broth micro dilution as recommended by the European Committee on Antimicrobial Susceptibility Testing (EUCAST) and MICs were read manually after 24 hours of incubation (17). The MIC breakpoints that were used are based on the established criteria by the European Committee on Antimicrobial Susceptibility Testing version 1.3, fifth of January 2011. Data collection and analysis was done using the SPSS 17, and differences were considered to be significant for P < 0.05. Our study included 60 cases of VAP based on their CPIS scores. In this population, 68.3% (41 cases) had underlying diseases including various forms of malignancy (34%), heart disease (14.7%), DM (12.2%) and trauma (39.1%). Of the 60 isolated strains, the frequency of different microorganisms were as follows: coagulase negative staphylococci 23.3% (14 cases), Escherichia coli 21.7% (13 cases), Staphylococcus aureus 18.3% (11 cases), Pseudomonas aeroginosa 18.3% (11 cases), Enterobacter spp. accounted for 11.7% (7 cases) and finally Klebsiella pneumonia 6.7% (4 cases) (Figure 1). Of the isolated strains of coagulase negative staphylococci, 35.71% were sensitive to vancomycin and 64.28% were fully resistant. About eighty five percent (85.71%) were resistant against cloxacilline. About thirty six percent (36.36%) of the isolated strains of Staphylococcus aureus were cloxacillin sensitive strains and the remainders were resistant against (methicillin resistant Staphylococcus aurous (MRSA)). About forty five percent (45.45%) of cases were sensitive to vancomycin and for 6 cases (54.54%) MIC was greater than 2 mcg/mL (resistant cases) (Table 2, 3). a Abbreviations: S, sensitive; I, intermediate; R, resistant. aAbbreviations: S, sensitive; I, intermediate; R, resistant; NA, not available. The incidence of VAP in patients receiving mechanical ventilation is estimated to be approximately 22.8% (18). The cost of VAP is estimated to be $40000 per hospital admission per patient with VAP and its estimated annual cost being approximately $1.2 billion dollars in the USA (19). Antimicrobial resistance is a threat to public health, worldwide and is associated with higher mortality and morbidity rates. Despite extensive knowledge about this issue, drug resistance has continued to emerge, especially in ICUs. In our study, the type and frequency of microbial agents causing VAP was as follows: coagulase negative staphylococci (23.3%), E coli (21.7%), S. aureus (18.3%), P. aeroginosa (18.3%), Enterobacter spp (11.7%). and K. pneumonia (6.7%). In a study by Heyland et al. the infecting flora in patients with VAP included methicillin-sensitive Staphylococcus aurous (MSSA) (9%), MRSA (18%), P. aeroginosa (18%), Stenotrophomonas maltophilia (7%), Acinetobacter spp (8%), and other spp (9%). These findings are supported by a prospective, multicenter, observational study of 398 ICU patients with suspected VAP (20). In this study, there was a similar distribution of pathogens-MRSA (14.8%), P. aeruginosa (14.3%), and other Staphylococcus species (8.8%) (21). The frequency of bacterial agents causing VAP varies in different studies. In some studies the most common pathogen was S. aureus while in others it was P. aeroginosa with low frequency for coagulase negative staphylococci. In a number of recent studies, the most common pathogens identified on culture of patients with VAP were gram-negative bacteria, S. aureus, and H. influenzae (18, 22). Lambiase and colleagues performed a microbiological analysis of 29 suspected VAPs patients. In their study, for 15 cases (51.7%) the responsible microorganism was P. aeroginosa, while in the other 14 cases (48%) a number of different bacteria were isolated, including Enterobacter spp (17.24%), Acinetobacter baumannii (17.24%), Staphylococcus aureus (3.44%), Klebsiella pneumoniae (3.44%), Escherichia coli (3.44%), and Haemophilus influenzae (3.44%) (23). Our study indicated a high resistant rate especially among the gram-positive cocci. Coagulase negative staphylococci showed resistance rates of 85.71%, 64.28% and 42.85% to cloxacillin, vancomycin and amikacin, respectively. S. aureus showed resistance rates of 54.54%, 54.54%, 90.90% and 90.90% to cloxacillin, vancomycin, gentamicin and amikacin, respectively. In a study by Wang and colleagues a total of 6,003 S. aureus isolates were analyzed from 2000 to 2004. No vancomycin-resistant S. aureus isolates were detected. One MRSA isolate had a vancomycin MIC of 8 mcg/mL and was confirmed as a vancomycin-intermediate S. aureus (24) while in our study for 6 cases (54%) MIC was greater than 2 mcg/mL (full resistant cases). In the study by Japoni et al. it was showen that three antibiotics including linezolid, vancomycin, and quinupristin/dalfopristin showed high coverage in gram-positive bacteria. The gram-negative bacteria in that study were highly sensitive to colistin, meropenem, and imipenem (25). In a study by Zervos et al. they found that mortality from all causes at day 28 was 32.3%. The majority of MRSA isolates had a vancomycin MIC ≥ 1.5 mcg/mL (115/158, 72.8%). Propensity score analysis demonstrated an increase in 28-day mortality as vancomycin MIC increased from 0.75 to 3 mcg/mL (P ≤ .001) (26). P. aeroginosa isolated in our study were sensitive to carbapenems (100% to imipenem and 90% to meropenem) and 50% were resistant to ceftazidime. This sensitivity differs from the study of de carvalho in Brazil that isolated P. aeruginosa with resistance above 70.0% to third generation cephalosporins and imipenem (27). While a surveillance center in the USA as part of an Intensive Care Antimicrobial Resistance Epidemiology (ICARE) program reported that resistance rates of P. aeruginosa, to fluoroquinolons, imipenem and third generation cephalosporins were 35.0%, 19.0% to and 14.0%, respectively (28). Also, a surveillance program center in Germany (SARI) reported a resistance of 18.0% to fluoroquinolons, 25.4% to imipenem and 15.3% to third generation cephalosporins (29). In a laboratory detection study of imipenem or meropenem resistance in gram-negative organisms, isolates of Pseudomonas aeruginosa had MICs that were at or near the carbapenem intermediate (8 µg/mL) and resistant (> 16 µg/mL) breakpoints (30). In April 2006, in a tertiary care center in Medellin, Colombia, three imipenem-resistant isolates of P. aeruginosa (MIC ≥ 256 µg/mL) were recovered. Two of the isolates were from patients with ventilator-associated pneumonia (31). In our study, we found increased resistance of E. coli to 3rd generation cephalosporins, aminoglycosides and carbapenems as well as high-level resistance to ceftazidime (50 mcg/mL). The higher rate of third generation cephalosporins-resistant E. coli in our study (> 90%) is significantly different from the rates reported by De Carvalho in Brazil (18.7%) (26) and the Sentry (surveillance program in Brazil) program (4.4%) (32). In a study by Mendes and colleagues, they found that E. coli was fully susceptible to imipenem and meropenem (33). In addition, carbapenem resistance among Enterobacteriaceae was still rare in that region (32). This finding also significantly differs with our results. The European Antimicrobial Resistance Surveillance System described resistance against 3rd generation cephalosporin (3GC) in E. coli as the most dynamic expansion of multidrug-resistant pathogens in the entire region (34). Although in 2008, less than one-half of European countries (14 of 33) reported their resistance levels against 3GC to be under 5%. Since 2004, the proportion of 3GC resistance has increased in 19 European countries. In general, a large percentage of ESBL-producing pathogens are now being imported into hospitals and ICUs (35-37). Meyer and colleagues have reported that the rate of Escherichia coli resistance to third generation cephalosporins has significantly increased between 2001 and 2008 (1.2% and 19.7% respectively with P < 0.001). The sharp increase in 3GC-resistant E. coli started in 2006 and affected almost all ICUs (38). Klebsiella enterobacter group isolated in our study presented high level resistance to third generation cephalosporins and almost full sensitivity to carbapenems. However, we could use imipenem/meropenem for the treatment of these patients with VAP. The number of cases belonging to this group was low in our sample and we could not compare them to other studies for analysis. VAP causing microorganisms in our region have become increasingly resistant to antibiotics which are commonly used in empirical treatment of this disease in our local ICUs. This further illustrates the need for more antimicrobial susceptibility tests and surveillance programs in our critical care units. We would like to thanks the Research Chancellor of Mazandaran University of Medical Sciences for their support. Implication for health policy/practice/research/medical education: This study showed that resistance of Staphylococcus aureus to vancomycin is increasing which can causes the antibiotic to be inefficient in terms of treating ventilator-associated pneumonia. Financial Disclosure: There are not any conflicts of interest. Funding/Support: This research was funded by Research Chancellor of Mazandarn University of Medical Sciences and was supported by Antimicrobial Resistant Research Center. 30. Laboratory detection of imipenem or meropenem resistance in gram-negative organisms.